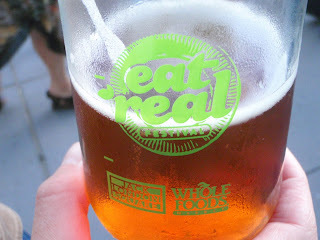 This past weekend Beta Wife and I decided to check out the Eat Real Festival in Oakland's Jack London Square. The theme: East Bay street food that's "real." That means the myriad food carts and kiosks were selling food that came from locally sourced goods, lots of it even organic. You could think of it as sustainable fast food. There were tacos made with Niman Ranch beef and ice cream from the Straus Family Creamery--locally roasted coffee and locally brewed beer. Did I mention local? And with more than 30 vendors that were part of "Street Eats" you could find every kind of food, from clam chowder to paella, and all of it priced from $1-5. The reasonable food pricing allowed us to try a lot of different things. Of course with all that food, we had to come back for a second visit on Sunday, if only to use the rest of our beer tickets. Even with a second trip, our late arrival caused us to miss places that had run out of food. Next year we're showing up early, and maybe this time I'll plan ahead and prepare by fasting. And that's really saying something, considering that I have a longstanding dislike of street festivals in general. They always seem to be crowded, dirty, and typically boring; I have had my share of disappointments. So needless to say, I was really not expecting much, and I was prepared to be underwhelmed and even slightly annoyed, ready to leave with more proof that no good can come from large groups of people wandering the streets in search of food and entertainment. But the Eat Real set-up was well planned. Vendors were spread out, allowing for lines to form comfortably, and there was plenty of room to sit and enjoy your food despite the huge turn out. (Unfortunately, a few particularly long lines caused some places to be overlooked. Maybe next year.) It was like a huge picnic in Oakland and everyone was invited. I think more foodie events could learn a thing or two from them. 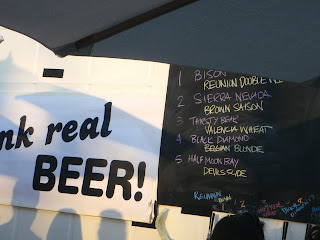 When I was reading about the Beer Shed on the Eat Real website, I found myself picturing a large tent filled with a few kegs of local beer, surrounded by bearded homebrew enthusiasts sipping from plastic cups and discussing various strains of yeast. In reality, the shed was more like a refreshment station with four separate areas, each with a different selection of local beers. To get beer, you bought tickets (and an optional souvenir mason jar) and away you went. $25 got us a glass and four 8oz tastings and we had the opportunity to taste some amazing beer. The best part--you didn't have to stay in one place with your drink. We were free to wander the festival area with our brew, and standing in a long line doesn't seem so bad when you have a cold beer to keep you company. Discoveries included: Drakes IPA, Blue Frog's IPA and Thirsty Bear's Irish Coffee Stout. 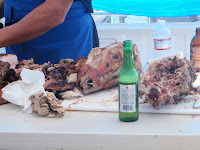 I have to admit, I almost didn't give them a try because of the pig's head sitting on the table. I mean, I know the point of this whole "real" food thing is to know where your food is coming from, but honestly, I don't like it when my bacon tries to stare me down. But after seeing a few peo ple walk away with oversized flatbreads filled with large, moist chunks of pork, I decided to be brave and try the whole-roasted pig from Chop's kiosk. 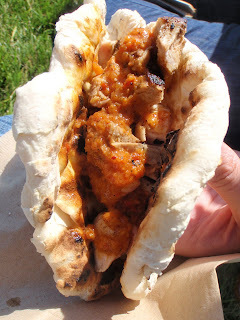 The flat bread was made fresh right in front of us, the dough shaped into perfect little rounds that became soft, warm, chewy shells for the meat. The pork itself was tender and moist, and was cut to order. We topped ours with a spicy pepper-based sauce and it was delicious. By the time we decided to go back for another, they had sold out. Hands down, the best food I tried over the weekend. And all from a restaurant that hasn't even opened its doors yet. 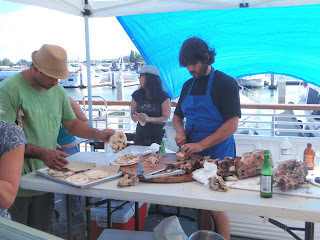 I would keep an eye out for the Chop Bar to open in September, in Jack London Square. I also really enjoyed the pulled BBQ chicken sandwiches from Zella's Soulful kitchen. They really hit the spot in ways that only comfort food can. 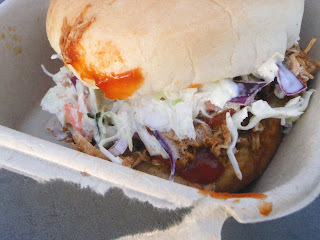 The sauce was sweet and smoky, and the BBQ was topped with a creamy, spicy coleslaw. A squishy white burger bun sealed the deal. 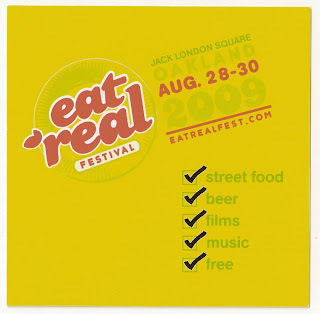 For a full list Street Eats participants and their links go to http://eatrealfest.com/streeteats.